required sealing temperature for the bag being sealed as well as variable conveyer belt speed control . The Band Sealing Machine is used to seal pre-formed & filled pouches like center seal pouch, three side seal pouch, stand-up pouch and zipper pouch which are made from seal able laminated film. 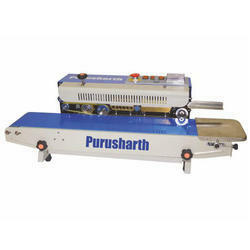 We are offering a wide range of Vertical Pouch Sealing Machine (Band Sealer).